The expectation of a fast response contributes significantly to email overload and can cost business dearly. Below is the full press release and key data. A quarter of us now expect response to email within an hour – leading to errors and stress says new survey. Technology is accelerating email response times, creating unrealistic expectations, email overload, errors and costly workplace stress*. Author of Brilliant Email and email management expert, Dr Monica Seeley points out that a few years ago a response to an email was expected within a few days or even a week. However, her recent survey reveals that today a quarter of us expect a response within the hour. Over a third of us, within two hours and over two thirds within half a day. Only a quarter of us think a response within one day is acceptable and only seven percent of us are prepared to wait two days. “Today’s ‘always on’ culture of email, smart phones and social media means we expect almost instant responses to our communications. We pressure ourselves into thinking that most email has to be answered and often as soon as it arrives. But like driving, the faster we respond, the more damage we do when we make a mistake. We are confusing speed of email response with effectiveness and allowing technology to dictate and potentially damage the way we work. 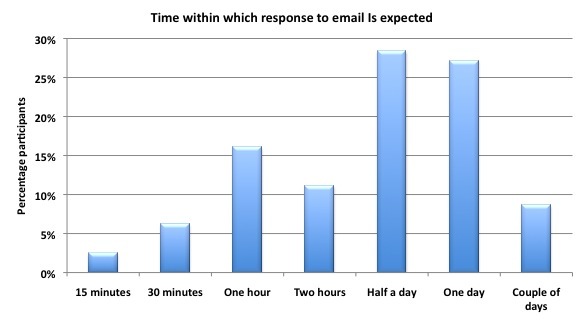 This survey highlights the need to reduce email overload and to make email reply expectations realistic with sufficient time for a considered response,” states Dr Monica Seeley. Monica Seeley explains that much of the pressure for fast replies is in the mind of the recipient saying many senior managers tell her they are surprised by how quickly people respond to their emails. 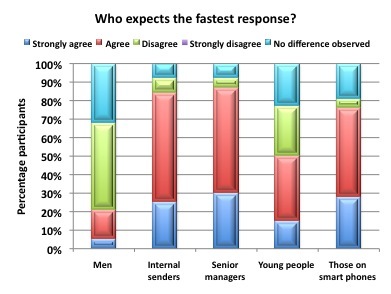 This is borne out by the survey which shows that most respondents (83%) felt that internal senders expect a quicker reply than external senders and (87%) believed senior managers expected a faster response than junior managers. Similarly, over three quarters of respondents strongly believed (76%) that people picking up email on smart phones such as Blackberry or iPhone expect a faster reply than those dealing with email on a conventional PC/laptop. To help combat unrealistic expectations and unnecessary emails Monica Seeley advises people to improve their email etiquette. For example by including a line in their email signature stating that they check their email at regular intervals but not as each email arrives. Alternatively she advises the use of an auto response with the same message. Similarly she applauds organisations that have a statement on their customer service webpage stating how soon they will reply i.e. within three days. She recommends that businesses start adopting similar frameworks for every day emails, especially internal ones. “Respond in haste and repent at leisure has been the mantra of many who have found their email used as evidence in a dispute. A wrong or unplanned response can be costly. This survey confirms my view that it’s time for us all to recalibrate our email expectations and reply times.” concludes Monica Seeley.